Perfect for those who are looking for help with good fortune, these yellow super tiny lucky cats have the symbols for "Kin'un" which means "luck with money". Small enough to carry around with you everywhere, this small good luck charm is a bright and happy maneki neko, also known as lucky cat, that holds its paws up high as it welcomes luck and fortune for its owner. With small yellow ears and a yellow collar with a gold pendant, this charm has a flat back so it can easily be held up on a flat surface with double sided tape. 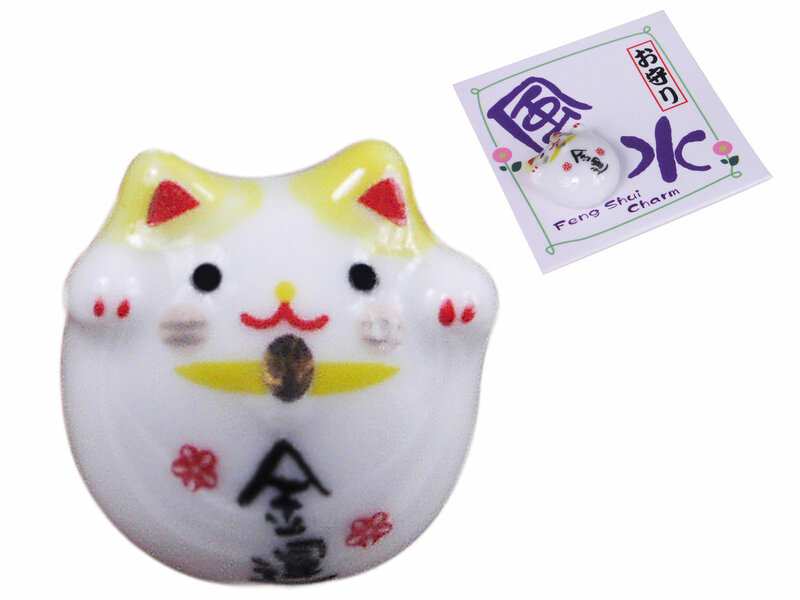 Decorate your work place by placing this lucky cat charm on the frame of your monitor or cash register so it may inconspicuously welcome money and customers. Accompanied with a small card that shows the rest of the feng shui colors and their meanings, these super tiny lucky cats are perfect small gifts for those who need a little luck bringing in their fortune. Made in Japan.